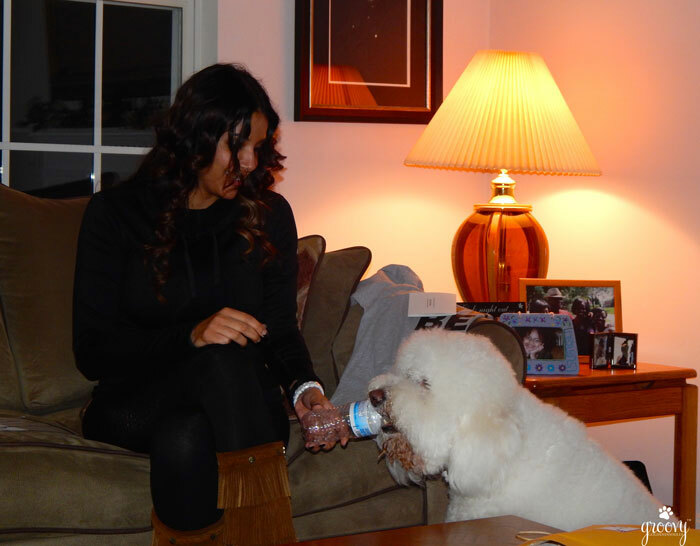 My dog loves water bottles! He’s what I would call on the edge of “obsessed” and I’m praying I’m not the only one out here with this problem. I CREATED THIS PLASTIC CONTAINER MONSTER! The first time it happened, he was just a young little dood. I remember it vividly. I was sitting on the floor playing with him and drinking a bottle of water. He tapped – tapped – tapped at the empty bottle with his furry little paw until he knocked it over. Two years ago, I even wrote a blog about what I thought was his true hidden talent. I called him Harley Houdini . Everyone else in the family scolded me, told me I would live to regret this. What did they know? Well shut the doodle door! Here I am years later writing about how they were right and how I am sooooooo wrong. This new revelation became apparent last week. My nephew stopped by and brought with him a lovely young lady. She’s not from around here, never met any of us before, to include Harley. After the introductions, and a casual volley of pleasant conversation, I offered her a beverage. She asked for water yet declined a glass. Suddenly my heart started to beat twice as fast. Right away I knew I should have just poured it in a freaking glass, but I didn’t. As soon as she twisted that bottle top, here came trouble from across the room. It disguised itself in the form of four legs, a swishing tail, and what looked a lot like a smile. 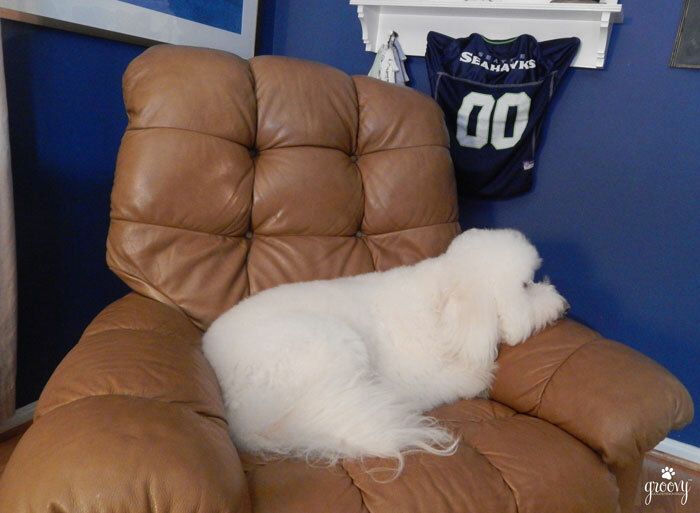 At first the victim guest didn’t catch on, but after a while her eyes were fixated on Harley. Can’t say I blamed her. 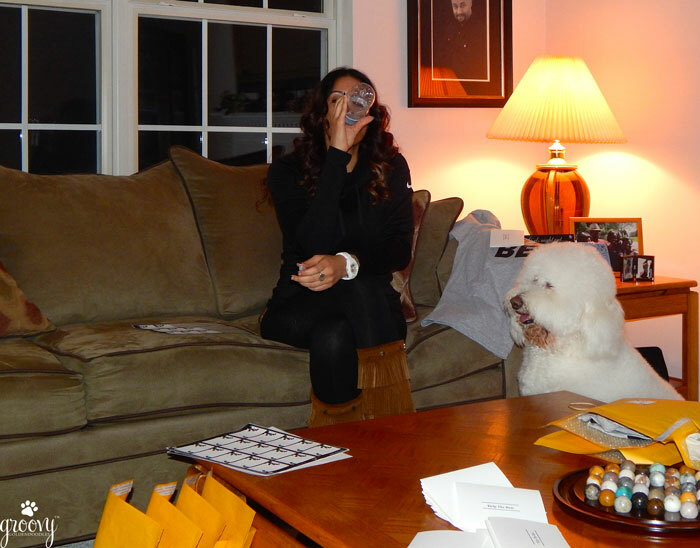 Once he caught sight of that bottle he eased on over next to the coffee table and sat! Once she noticed him, I felt the compelling need to say something. But how do you tell someone, “it’s okay – he just wants your water bottle.” There’s really no way to say it other then to… well say it. Why didn’t she call Harley away? Why didn’t she “shoo” him? Why did she ever allow it to get this far? I was relieved to see her smile as he gently took it and settled down on the floor to perform for her. Pawhaps the next time someone comes to the house, I won’t offer water on their first visit. I’ve got soda, juice, wine, coffee and tea. Yeah, I’ll serve one of those beverages. Have a pawsome weekend. Be kind to someone and as always, thank you so very much for sharing me with all your friends! Bailie and I love to pick up water bottles we find on walks. Nothing compares to the crunching sound they make. We find it irresistible. So, Harley, no worries, you are totally normal. Emma, I am happy to hear that. Harley has a few of those bottles inside a toy, but he’s not very interested in those. He’s only happy removing the tops and then it’s a wrap! Claudette, I would never “encourage” anyone to do this, if you feel Ziggy will swallow the cap or consume the wrapper then please continue to do what you’ve been doing. Harley is just “strange” but he’s my strange, so he’s a keeper 🙂 But don’t you just find their individual personalities and quirks just the best? I love it 🙂 Take care and enjoy your weekend my friend! My evening with you and Harley was an absolute pleasure. He is a beautiful, gentle, kind and well mannered dog. I’m glad I got to experience the “water bottle challenge” with Harley. His strategic measure to dissemble the cap was impressive. I really enjoyed him. Thank you for welcoming me into your home as I look forward to seeing you both again. I’d hate to have to be pretentious to my company, and say something like “Oh, I’m so sorry we only drink water out of glasses in our household”. LOL…then that would mean more dishes to wash, and who wants that? Exactly JanK, so when I offered a glass (trying to remember my manners) I was “ok” when she declined until I saw Harley eyeing the bottle. Then I thought “oh noooooo” because I knew what was coming! Yes, please tread lightly if you start this game, it’s not easy to break! Thank the doodle she was a great sport with the whole thing! Take care…. Really? WOW! But did Norman play with those water bottle toys? Harley isn’t very interested in those, he prefers to take the tops off and then he discards it! Go figure! Thanks for stopping by, enjoy your weekend. Ha-Ha, you’ve got jokes Dixie don’t you? Harley will bring the bottles, and we will have to wrestle them from him in-between scrimmages! Just let us know when and we will be there! Elaine! I’m so happy to hear I’m not alone 🙂 Did Haley ever “harass” your guests? This was truly a first for me! Yes! 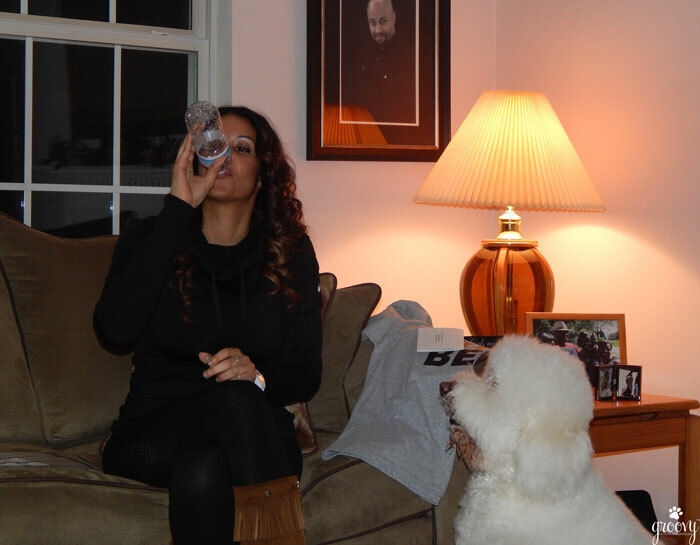 It’s even more embarrassing when somebody stops by and has brought their own bottle of water, which Haley begs for, lol! It’s all my fault because I sometimes put treats inside empty water bottles so Haley has something to keep her busy for awhile. Elaine, you’re a girl after my own heart. Just when I think it’s the worst thing that could ever happen, I find out (1) I’m not alone and (2) the people keep returning to the house, so I figure it’s not the worst thing that could ever happen! Thanks so much for stopping by, I might try adding a treat in the bottom of the bottle on day myself. I just literally laughed out loud reading this! Hahahaha!! Then Rebekah, our job is done! 🙂 I love it when people enjoy Harley’s antics! Makes my day.